As I do each year, I’ve looked back at what we have accomplished in 2018. It’s nice to see what has been accomplished over an entire year, rather than day to day. In January, we took part in the Outdoor Industry Association trade show in Denver. This was an exciting and large show where we introduced our brand to many outdoor industry associates. Cindy had an article published in Skin Deep Magazine entitled “The Power of Botanicals”. In this article, Cindy wrote on the growing scientific evidence on the effectiveness of herbs in skin care. Skin Deep Magazine is a print and online magazine geared towards professional estheticians. We held several events at our store. Once was a seminar for esthetician students on holistic skin care. We hope to put together a program including additional topics of interest to estheticians. On the farm, we had several farm tours, both private and public. We had our 2nd annual Farm Dinner which was put on by GB Culinary. It was quite hot that evening, but he lavender was beautiful. Our first Lavender Yoga event occurred in July, and we hope to have several more this summer. Two interns were hosted at our business; one business intern, one herbal intern. 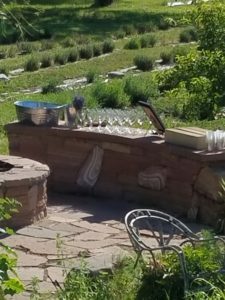 The Colorado School of Clinical Herbalism brought their students out to our farm during the summer for a portion of their curriculum. We took part in Boulder County Farmers Markets again over the summer; both Boulder and Longmont. This is a great place for us to show our products to customers, both local and those visiting. 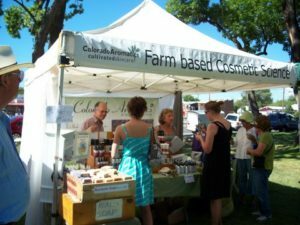 There were two lavender festivals we participated in as vendors; one in Palisade CO, the other at Chatfield Farms with the Denver Botanic Gardens. Our brand was featured in Denver’s 5280 magazine in an article about spa treatments. Our products were featured in several blogs where we received great recommendations. We continued to offer facials in our storefront from our esthetician, Karen Kress. We also visited several esthetics schools where we were able to introduce our product to students. Our products are offered in more stores this year than ever and our online and in store business also grew. We’ve been having fun on social media; mainly Facebook (where we sometimes have giveaways) and on Instagram. Maybe this year we will perk up on Pinterest account. We’d love it if you followed us. 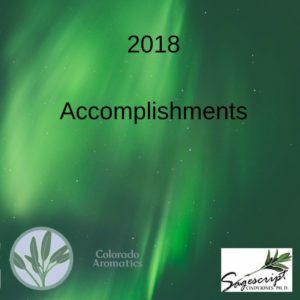 We’d especially love it if you mentioned Colorado Aromatics online or left a review on one of our products on Google, Yelp, Facebook, Instagram, Pinterest, or our own website; http://www.coloradoaromatics. Their were two new products introduced in 2018. Herbal facial steam includes our most beautiful and aromatic herbs from the farm. Our Professional Parsley C Serum was introduced this year and featured in two magazines: Skin Deep and Dermascope. This is a 10% vitamin C serum intended for use by estheticians. It has been well received. In our spa we have been experimenting with herbal poultices and gua sha to accompany our Colorado Facials. Gua Sha is a technique of scraping the skin with a massage tool to improve circulation and blood flow to the skin. Our consulting business has grown and we formulate and manufacture cosmetic products for several other companies. I also love looking back over the year to see how far I’ve come and what I’ve learned. You had a very productive year!